Circle garden entrance to central pathway in perennial garden. I love the way the pathways just invite you to explore! Your tropical garden is so serene. Yes, I enjoyed the weekend in my garden and I really enjoyed the post week-end views of your garden. Can't tell you what I like the most in your garden....♥ it all. Have a great week Meems! Aah, I could spend a whole batch of weekends just drifting around your garden, Meems. What makes it extra-special for me is that they are all such growable plants for me. Seeing them grow so beautifully in your garden is really inspiring. Ooohh, Ooohh, Ooohh, Once again a lovely tour through your quiet, colorful and peaceful gardens. I am in love with your Miss Muffett caladiums. Thank you for the tour, it was a great way to start off the week. 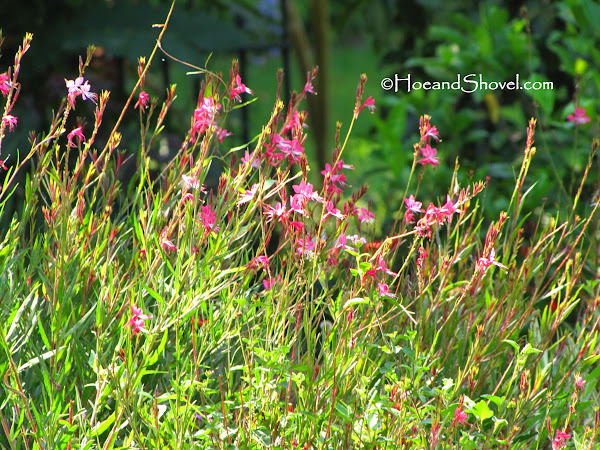 I can see why your week would begin and end in your gardens! It looks so lush in your garden. I appears that you are ready for a garden tour. Everything so neat and tidy. I always enjoy a stroll through the garden -- yours and mine. 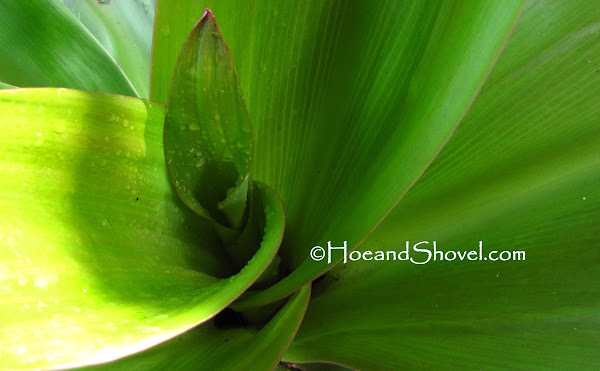 I'm waiting for agapanthus buds; glad to see your blooms. I love how you've named different parts of your garden. I do the same thing with mine. 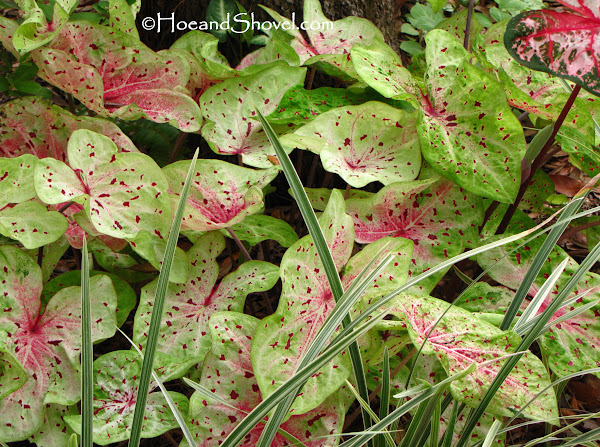 I LOVE those Caladiums!! 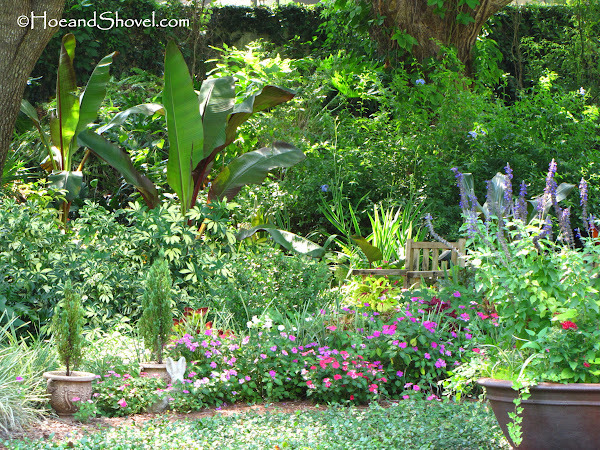 Gorgeous views of your summer garden. How in the world do you keep it all so neat and plant 100's of caladium bulbs too? 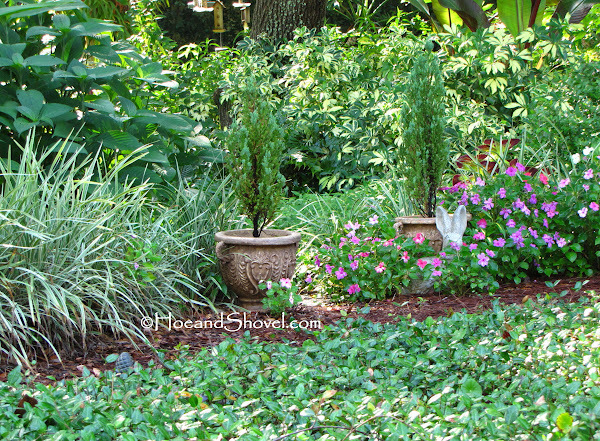 Your circle garden's ground cover and pathways leading to other gardens is just coming together perfectly. 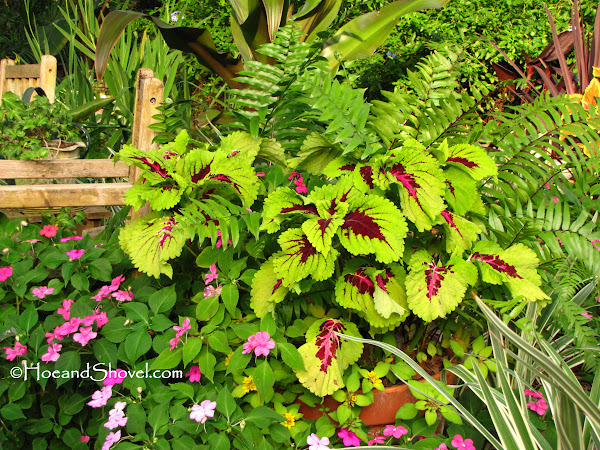 I always know where to go to be blown away by a garden full of fantastic color, foliage and flower wise! I never tire of your garden, keep those tours coming.... I am off to have another look at your mosaic tutorial - I think I am going to make one for my butterflies! What wonderful rich color! Your flowers are gorgeous! What beautiful Blue plumbago. So nice to see the beauty in your pictures! Your pictures are always perfect! The tropical gardens might be my favorite place... can't say for certain but especially right now with this heat it is a amazing respite. It turned out to be decent with a bit of a breeze and not nearly as humid as expected for June. We have to make the most of the time in our gardens with summer approaching rapidly. Thank you... wouldn't that be a nice gift to share a walk in a garden someday. It is remarkable how very similar our climates are. You've been a busy girl, too. Enjoy your summer. Miss Muffett is a prize among the foliage plants... I hope you get to love her even more soon! Some of my agapanthus are finished, some blooming, some just budding... yours are probably right behind mine. Everything does seem to be right on time this year. Lots still going on and summer is almost here. I keep thinking I'm going to wind down any day but it isn't happening yet. Maybe July??? 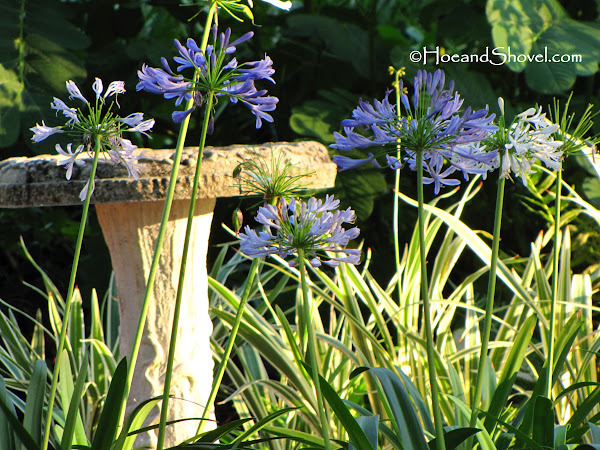 I have seen agapanthus is full sun and they don't seem to do as well as partial sun. It will be okay though until fall (will acclimate) but I don't think for the long haul I would leave it there. The circle garden has really filled in and 'feels' more natural this spring. Every season brings new excitement doesn't it!! I do love the tropical pathway. 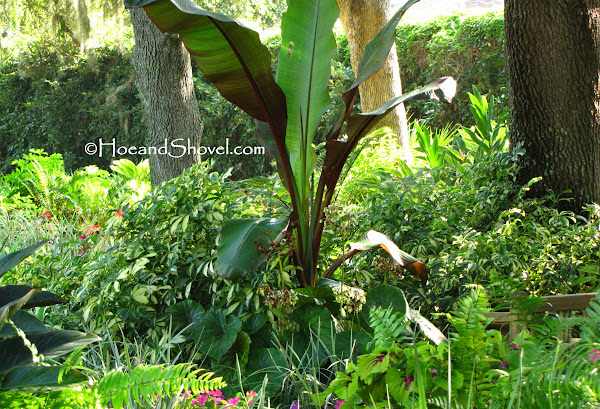 All the shade and lush plantings feel very peaceful (and much cooler than the rest of the garden midday). 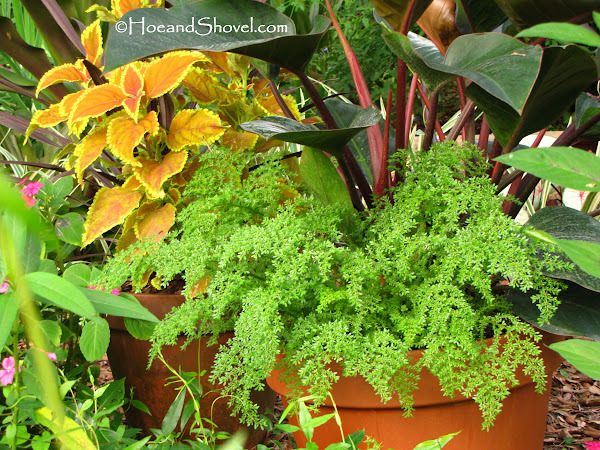 The congo philo has artillery fern growing at its base. 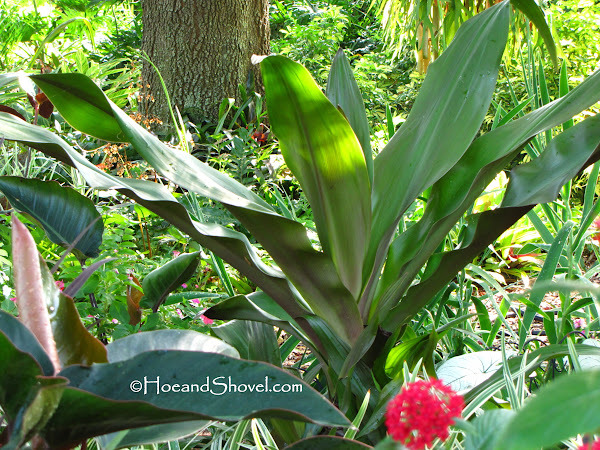 It is a shade plant from Riverview Farms you can find at Home Depot. It has been a good performer... I'd like to try it next as a ground cover. Sorry I meant to give you the entire name... Pilea microphyllia. You have only to step out your own back door... but your kind comment made my day. Thank you. Blue flowers are a lot of fun. 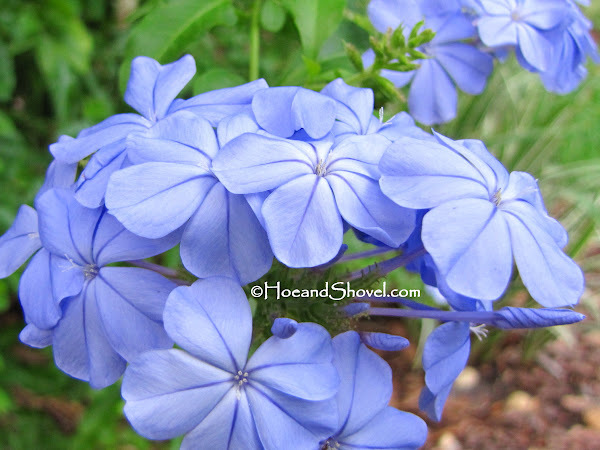 This blue plumbago is an easy one to grow in this climate. 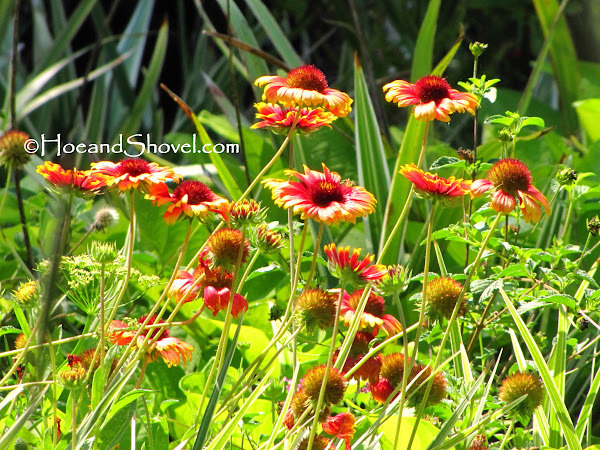 Your garden looks luscious. I really like the bunny peeking over the blooms. Everything looks so lush and like a verdant dreamland. You must be getting more rain than us here in Texas. 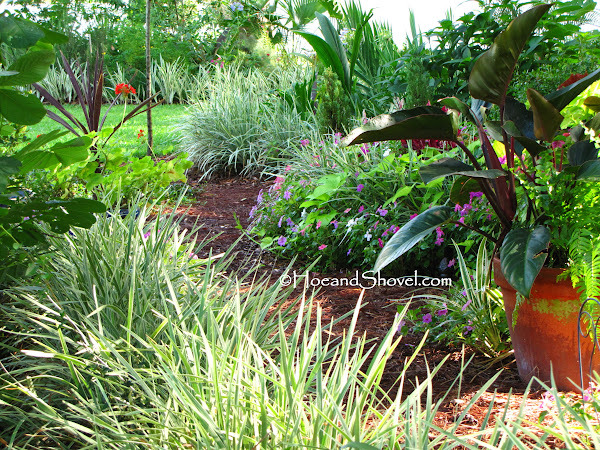 What is that gorgeous Calocasia in the north berm photo? It has a scalloped leaf edge that I've not ever seen in this plant. Thank you so much for all your kind words and for letting me know you enjoyed my blog. It sounds like you and your husband are heading in the right direction with your desires for a garden. You are doing the right thing searching for good advice and doing research for your area. I wish I could help you but I don't know anything about growing in clay. We have very sandy soil down here in this part of Florida. I've done a lot to amend mine with hopes of making it more and more organic with each passing season. 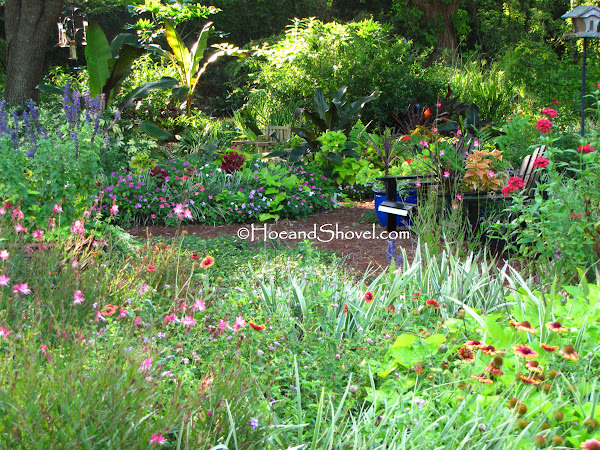 You might want to do a search of garden blogs in your immediate area to connect with gardeners close by or try Garden Web Forums (http://forums.gardenweb.com/forums/) and scroll down to Alabama. In the meantime feel free to visit here anytime. 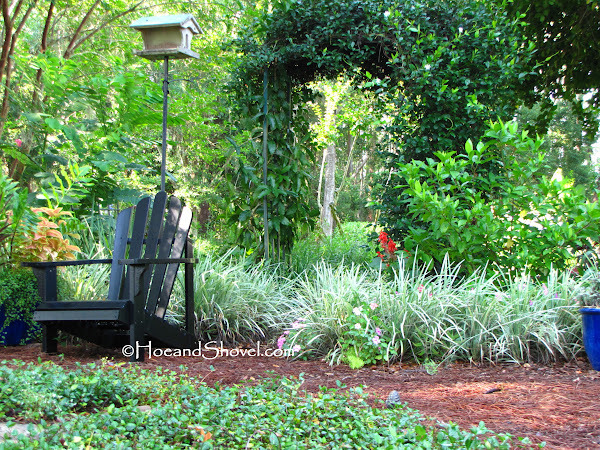 You might pick up some design tips or ideas you could implement in your own garden. Keep pressing onward with your gardening instincts. 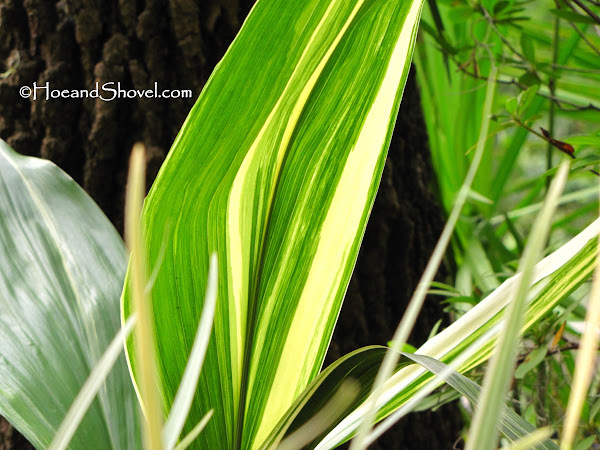 It does take time and energy but there are ways to reduce maintenance by creating a garden of natives and making correct choices for your environment. I wish you all the best in your journey. Not much rain. Thank goodness for my shade and an irrigation system. 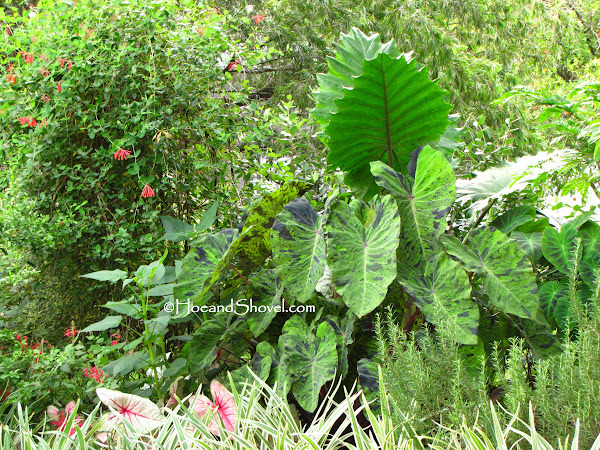 You are asking about the Portadora Alocasia. It is a very fun one. So full, so lush and beautiful... wonderful combinations, Meems! 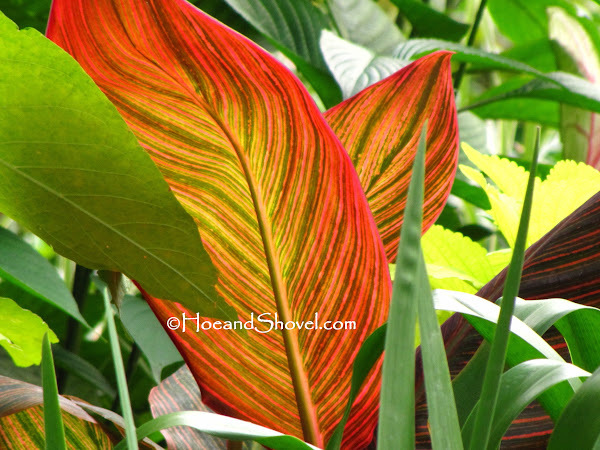 and I do lust after that caladium. 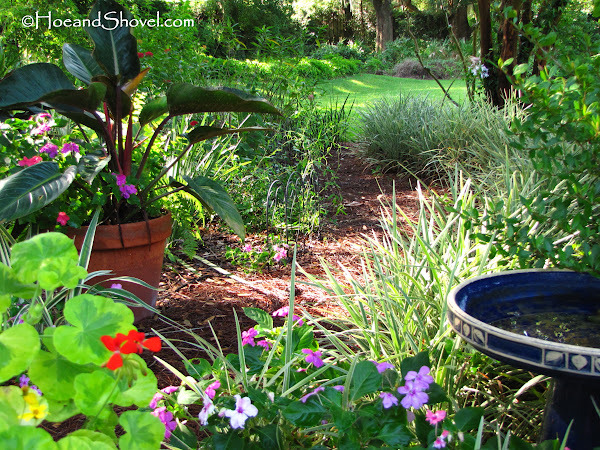 Our summers are so hot and dry compared to the wet and cool spring, that we have to lean toward more drought tolerant. Lovely cladium; have not seen this variety before. What is it called?